Abou Farman is a writer and artist, and author of Clerks of the Passage (2012). He is assistant professor of anthropology at The New School for Social Research. It was nearly midnight in the Peruvian Amazon when our cameras started rolling. The moon above was as full and as close to the earth as it had ever been. Astronomers call that a super moon, and because we had so many night scenes, we planned our shoot to coincide with its light. 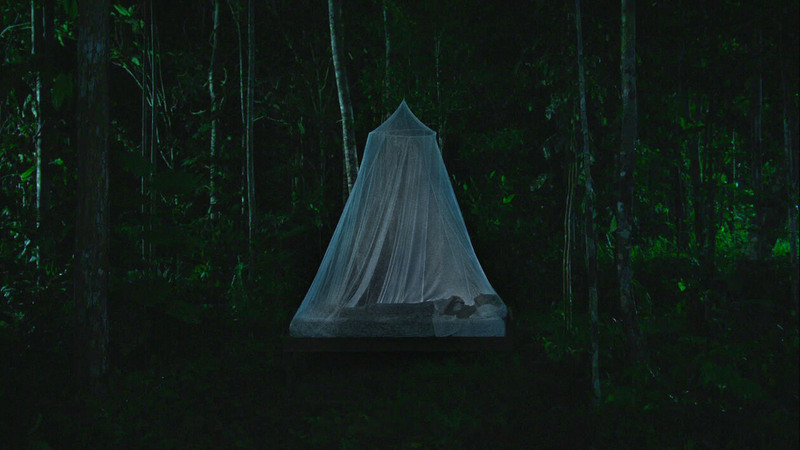 As though unfurled from the super moon’s big disc, a very tall mosquito net came shimmering down like a cone of light from the top of the canopy over a bed in the middle of the jungle. The scene looked as much like a fairy tale as like a funeral. Which is just how it should be, for all funerals are part fairy tale anyway. The main actress, Ana Cecilia Stieglitz, walked through a short stretch of jungle, slipped out from behind a towel, and crawled in to lay on the bed. Her only direction from the co-director Leonor Caraballo—Leo—was to lie there in the middle of the night as still as a corpse. It was no secret to anyone on set that Leo, my partner in art and life, was directing her film while suffering a terminal illness. A little over a year earlier, she had seen her old breast cancer metastasize to her bones. She’d been given a couple of years and told to rest. 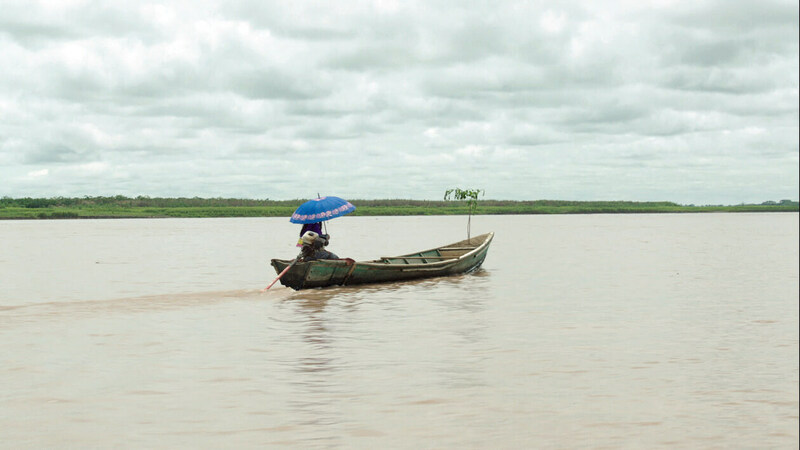 She opted instead to travel to the Amazon and pursue her film. So from the start, Icaros: A Vision was more than just a film. It was her experiment in dying. And living on. Though not exactly autobiographical, the film draws on our own experiences as it tells the story of a woman with terminal breast cancer who comes to the Peruvian Amazon seeking a miracle, but ends up confronting her mortality instead. We—Leo, her close friend Matteo Norzi, as co-director, and I, as producer—were filming at Anaconda Cosmica, the oldest of the many Ayahuasca centers set up to assuage the fears of Westerners who have found little in clinical medicine to treat their infirmities—physiological, psychological, social. The Shipibo people, who run the healing center, refer to these Westerners not as patients but as pasajeros, or passengers, capturing both the transience and the poetry of the encounter. Leo and I were once pasajeros, too, exploring the world of Amazonian shamanism, disease and the psychoactive plant Ayahuasca. In the jungle, there is never any silencio. At every moment, life declares itself with vibrations of varying frequency. Life forms are also wave forms, sound forms, and here on this patch of earth, there are more forms of life than anywhere in the galaxy. What is called the Amazon is the largest pool of tropical carbon on earth, 90-140 billion metric tons to be precise, covering about six million square-kilometres across eight countries, around a 4,000 mile network of snaking rivers pouring into the big one that gives it its name. Life folds out of this carbon. Ten percent of the earth’s known plant and animal species live here, including one out of every five bird species. Over centuries of rummaging, biologists have unearthed at least 40,000 different plant species, 16,000 different tree species, 427 mammal, 1294 bird, 378 reptile, 427 amphibian, and around 3,000 fish species. A grand achievement, this counting, but it only represents the life that we have seen and tabulated, which accounts for a mere 3.5 percent of all the species out there in that rainforest. Most of what’s there is life that we can’t see and can’t count. Mathematical models say there would have to be between two to 10 million species in the Amazon, mostly unknown and undiscovered and likely unknowable and undiscoverable—what scientists call “dark biodiversity,” beyond our faculties and techniques of detection—all of it buzzing in and through about 390 billion individual trees. At any rate, counting may be redundant. It is abundantly clear this is the richest, darkest biota anywhere. And if much of it is life that you can’t see, it is often life that you do hear. But what you hear of the jungle, once you learn how to listen, goes beyond the sounds of animals. It’s not just creatures making noises, not just the jaguar and the monkey, the beetles and tree frogs, the million birds whose calls ring out in the jungle. Most such animals present us with the obvious decibel, the vibration range that human ears can tune into, between 20 hertz and 20 kilohertz. By contrast, bats hanging all above us in the jungle can pick up over a 100 kilohertz and pink dolphins down below can hear up to 180 kilohertz. If you listen ultrasonically, like they do, you will learn that plants chatter, trees and vines rattle on, that roots and soil have their songs too. Those too become part of the sound mix of the jungle, because when you listen carefully what you hear is the cry of existence, from the birth pang to the death moan, the very acoustic ecology of creation. When you listen carefully you hear all of life—including the deaths foretold by the moans of the mythological bird, tunchi. For as many creatures come to be in that jungle, the billions of life forms molting into being, exactly the same amount end up dying—they are dying all the damned time, now and now and now and now. That night in August, when the assistant director called for silence on the set, the human crew and all other creatures looking upon the set obeyed. For a moment, just a moment, it felt like there was total silence, as though all life had stopped. From the back where everyone was watching, Ana’s profile appeared still and cold in the light of the moon. Here was this body that was both real and imagined, that was hers but also made up by someone else, that was concrete and conjured, that was the director’s but also an actor’s, that was not alive nor dead, that was a corpse and an image, staged and real, a life and a death, all at the same time. In that suspended moment, all of it got rolled into one and struck me dumb at the throat, perhaps it struck the whole crew, along with the mosquitos and frogs and crickets and snakes too, because they all went quiet. Dead quiet. Until, a few seconds later, Leo called “action” and life reinhabited its frequencies. The camera, the boom, the maggots, the termites, the directors, the actors, all. Two shamans, Artruro and his abuelo Guillermo, one young, one old, from the two ends of life, entered frame, humming their shamanic vibrations, smoke from their mapacho pipes trellised around the netting. I was crouched in the back sitting on my heels, and felt unabashed, sentimental tears dripping down my cheeks because it had become clear what she was doing. Leo was directing her death. And maybe her afterlife too. Dying after giving up in the middle of a shoot would have meant an afterlife of remorse. Worse, it meant a before-death of remorse. That’s what she did not just with the film, but with the rest of her days, our days, with every aspect of her time left. She was composing, choreographing, aestheticizing, experimenting with the whole social, personal, and pharmaceutical process of her dying. Everything around the film, everything in the chemistry of the cancer, everything in the social landscape of care was enlisted in the artifice of dying. That night in the jungle, we—everyone in the cast and crew—became part of her death scene, and therefore of her actual dying, and in the days that followed it became increasingly difficult for me to tell the difference, though I know that for the crew this was not the case. They were professionals doing their work, responding to a director, to a woman; they did not see the dying person. They knew she had terminal cancer, but they were surprised some months later when they received news of her passing. If the cancer was the direct cause of her death, the shoot was a catalyst. Shooting in the middle of the jungle with a cast and crew that, at its height, reached forty people, was not an easy task. We had to battle disease and animals; we had to face disgruntled DPs and ADs and APs and Boom men. We had to make food over an open fire for twenty to forty people, three times a day—people who we never managed to satisfy with the food. Rats invaded the “kitchen,” which had no sealed storage; bats and tarantulas crept into the cabins; ants found the protein bars in the backpacks. It seemed like a crew member got hospitalized every other day. Everything was creaky and vulnerable. We often had to work nights, because so much of the film takes place at night, when the Ayahuasca ceremonies are held. For six weeks, no one got enough sleep. Often Leo didn’t make it through the whole night. She would leave directions and hobble off carrying a bottle of water to her own mosquito net, where she would take her trial drugs and supplements and try to fall asleep. The young, beef-stew eating crew returned, beat, to Lima. It took me weeks to get back up on my feet in New York. Let alone a body being ravaged from the bones out by metastasis, sacrum and femur pockmarked hollow like the sea-washed fossils Leo had collected obsessively as a child on the coast of Argentina and kept around her as her favorite possessions. The jaws and tusks of two-million-year-old Mastodons that she dug out of the sand at the age of six and carried everywhere with her the rest of her time, perhaps as testament, already, to the possibilities of long term survival. What to make of the fact that the parts of us that survive longest into the future—the bones—are the least organic, the deadest, parts of us? When she was first diagnosed with cancer in 2008, Leo started gardening obsessively. She liked the hardy plants—the boxwood and the hydrangea that spreads its tentacles quietly, the ancient fern and the moss that possessed the ability to grow not in soil but on stones and rocks. In winter, the landscape would turn desolate, apparently lifeless and bare except for a few evergreens that stood out stubbornly against the grey bark of the forest around them. And then spring would bring a kind of suspense. Even though the regularity of nature promised its own resurrection, still, the return of lushness, of weeds and vines crawling and leaves sprouting back on the branches, would always come as a surprise. After all, this time around, they could just stay dead for good. But, no, this time around, once again, they did not. She would watch for the first buds, the first leaves, marveling at how from one day to the next the dead flora seemed to erupt into life again. It was possible that such a thing might happen in nature itself, that you might die only seasonally. Is your season done, Leo? I keep asking incredulously now that she is gone. Are you sprouting elsewhere? Are you the one making these sounds I’m hearing? In some part, it was all that rainforest life that had drawn Leo to Peru. When she came back from her first visit to the Amazon, she simply said, “There is life on every surface.” There, nothing is spared the onslaught of living. And in the middle of surplus life, of all that cellular expansionism, she felt the contrast of her own cells moving her towards non-life. I think it was then that she decided she wanted a natural burial instead of a cremation—no coffin, no chemicals. All she wanted was to be wrapped in a Shipibo fabric. Right after her terminal diagnosis and through the winter that followed we struggled hard to keep the disease in check and for a while we managed. For a whole year she was stable. She felt better, even. Still, in the world of metastatic cancer, stable is a narrow frame. On average, women with her condition get another two and a half years of life. We had already started on the script and finished some scouting when the diagnosis came: it had spread. Everything became accelerated after that. We had to avoid filming during the torrential rainy season, so we knew it had to take place that summer or never. Certainly, that’s what Leo felt. She kept saying, “I don’t know how much time I have,” or “I don’t have ten years,” or “I don’t know how I’ll be next summer.” We accelerated the schedule, then pushed it back, trying to balance production matters with Amazonian weather, my job, and Leo’s health. So that’s how we settled it: August or never. She said never was not an option. We faced those moments bluntly. I’d say to her, “It’s not too late to stop, you know. We haven’t spent much yet or committed people’s lives.” I said those things even when we got down to the jungle in August and the crew was streaming in. I said, “We can turn back, it’s not too late.” In truth, by then it was—there was no turning back. We were all more scared of turning back than continuing through any difficulties. She imagined herself dying anyway, and dying after giving up in the middle of a shoot would have meant an afterlife of remorse. Worse, it meant a before-death of remorse. Leo was directing her death. And maybe her afterlife too. But in the earlier days, it was realistic to consider stopping. A friend who had suffered through cancer but was now “cancer-free” told us we were crazy. Leo should be resting in a peaceful environment, she should be eating well and taking care of her body, quite the opposite of everything entailed in a shoot. When our friend left, we cleared the walnut and almond bowls off the table, and talked about it again. “I prefer to have a film,” she said. Waiting for death was not her thing. And it was not just about making a film. For Leo, it was a commitment to the subject, to the creativity she had rediscovered alongside her Shipibo friends, to the new relationship to death and life she was learning and making up and experimenting with. So, more than anything, this was a way of dying, her way, and accordingly it was often difficult and painful, it involved both designing her death and accelerating it. It was, equally, a means of living now and living on, even if not cleanly. And for us who survived her, who are finishing the film, it’s an on-going funeral procession as well as a creative afterlife. But what if we had stayed home? What if we had stayed and she had rested and done rounds of chemo and rested some more? Would it really have been just a matter of a few weeks or months more? Could it have been a whole year, maybe two? How many months’ extension would make it a valid cause for regret? Six? 10? 24? One? None? We asked ourselves these questions everyday as we edited the film in her absence. But we don’t have any way to answer them. What is the appropriate calculus? How do you measure or feel time here? What is the relationship between quality of life, as we pithily call it, and quality of art? What is the exchange rate? Is death a valid currency for this exchange? “Yes, of course,” I’d say, and I’d add Michael’s card to the pile. One day in early October, I heard her come down for lunch as I was squeezing lemon over the organic lentils I’d cooked. Food for the beginning of fall; food that was healthy, benign. She could still eat lentils back then, before her diet got subjected to a drastic austerity regime by her inability to digest. In the shuffle of her feet I heard something new. It heralded the heaviness of a different sort of time, thick and slow, covering but little distance at an interval. And I heard her sniffle, between each step, like punctuation. She looked thin walking through the kitchen. When she sat at the table I saw pools of tears in those giant eyes of hers. I clenched the spoon hard and dished out the lentils meticulously, deliberately, in measured calculated movements, so as the lentils would not fall from the spoon. So as I would not overspill my bounds. It would open the floodgates if I did. I was a dam, my job was to hold it back. And sometimes that required squeezing the spoon real hard and speaking real slow, in measured, well-engineered tones. Without emotion I asked her, “What’s wrong? Why are you crying?” We’d had a trivial argument over the film the night before, something about editing equipment and additional computer speed, and though I knew better, I wanted the answer to be about that, about a little fight, the emotional aftermath of a dispute. Even as I wanted that, I also knew that by then those arguments were no longer about their purported subject, no longer trivial; by asking about more computer power, more equipment, she wanted to make sure I was doing everything possible, at any cost, to help the film. The film was also a proxy for care and commitment. All I mean is that that day, over the lentils and against all reality, I wanted her tears to be about something petty. She unfolded her fist and a blue sticky came popping out with acronyms and numbers scrawled on it. I didn’t have to read it, I knew what it was: bad news. New test results showed her cancer markers—CEA, CA 29.97—suddenly way up, more than double the normal range in each case. It was the first time the results came back so skewed. If you walk around New York City, you will soon notice that scaffolds are everywhere. The city, always under construction, is half made up of metallic exo-skeletons. That’s how I had come to see our life, propped up by scaffolds that had themselves become part of the infrastructure of our existence, exo-skeletons that allowed us to continue to build. But in moments like that, when the should’ves attacked, I could hear the creaking as the city of scaffolds wobbled around us. I also knew that any expression of regret was also a cry for re-assurance, for the careful re-balancing of the infrastructure. I knew—or perhaps I fooled myself that—there was enough in our footage to do justice to the phosphorescence Leo had always aimed for in her visual language, the vibrant sound composition and the hallucinatory storytelling she wanted. She was not always convinced that we had enough to get there. She was a skeptic and a pessimist. What I can say is that she had—and gave us—what one might call a vital death, a death with the full vitality of life in it. At the cutting table—or, at the end, the cutting bed, for she watched and conducted the edit horizontally on a mattress, surrounded by pillows—she would despair seeing a bad scene. Whenever we got stuck on a bad cut, everything seemed on the verge of collapse again. The whole edifice of being was at stake. For the risk was much more than a formal failure in the film; if there was failure in the film, then all of it, all that struggle and this dying would have been in vain. Poor film. Can a film bear so much weight? We lowered Leo into the ground in upstate New York wrapped in the same Shipibo fabric that covered Ana under the mosquito net during the supermoon in the Peruvian rainforest, in scene 128, the last and first scene of the film, the last act of Leo’s own life. And so, as she wanted, her molecules are becoming other things now, and I am sure whatever molecule is binding itself to Leo’s is immensely more creative, more fierce. We are told for a death to be a good death, we must arrive at peace and painlessness, love and meaning, calm and order. In other words, we are asked to somehow know, have valuations and a sense of the worth of such things. But the truth is we don’t. Meaning and order and comfort in death are fictions, secular humanist fairy tales for adults. Even though she chose hospice over futile medical interventions, Leo did not have a good death in the widely accepted palliative sense—few people do. She could not tolerate pain medication, she had some horrifying hospital experiences in the last weeks, and did not manage to put order into most of the things she wanted to leave orderly. Above all, she did not get to see her film finished. Questions of value and peace and meaning were left unanswered, tugging at us like a tangle of ropes from the other side. What I can say is that she had—and gave us—what one might call a vital death, a death with the full vitality of life in it. I don’t know that there is a formula or a description for a vital death, or a prescription. But I know that as a kind of experimental dying, it requires a different ars moriendi, one that does not eschew hardship and risk, one that, for us at least, often meant lack of clarity, a struggle with new and unknown things, an exposure to suffering. More than a good death, I think Leo wanted to measure up to life, to pursue its vibrant often contentious expenditure rather than its quiet expiration. The film, her experiment in dying, the creative struggle through the life of images and images of death, had much to do with the mad vitality of life itself pulsing out of the jungle. She had obsessively recorded the jungle sounds, wild tracks taken and labeled at 4 a.m., 5 a.m., 6 a.m., and so on through the day. That sound provides the baseline hum and rhythm underlying the whole movie; the vibrations of life become the experiential underbrush of the film. In thinking this ecology of creation, of life, death and art, I reach back, as she did, into the excess of life in the Amazon, knowing that for that sort of life these questions are meaningless. It doesn’t calculate worth, it doesn’t assess meaning. But it does create incessantly in the face of death and it participates vigorously, for the most, in the proliferation of this experiment we call life in the dead universe of matter around us. And yet, I think to myself, matter, too, is made up of waves; just like life, it is vibration. Just like death. That great experimenter in dying, Timothy Leary, once said that death is only a different radio frequency. So now I hum every morning, or when I ride the subway or buy groceries, hum like a jungle insect, hum as did the shamans all those many times in the darkness of the jungle around you, Leo. Hum because maybe you are picking up my ultrasonic frequencies, through which I keep trying to tell you, for what it’s worth, that it’s strong, the film, it’s bearing it all—you, and us. Icaros: A Vision is opening its theatrical run in New York City on May 19 at Metrograph theater.